It's funny how one shot can change the fortunes of a basketball team. Rewind with me to the night of February 7th, when the #1 Indiana Hoosiers visited the Assembly Hall to take on the Fighting Illini. The Illini were in the midst of a three game losing streak, and had dropped six out of their last seven games, and came into the game with the Hoosiers at 15-8 overall, but just 2-7 in the Big Ten. All signs pointed to yet another loss, and what most certainly would be another season without an NCAA Tournament appearance. But lo and behold, Tyler Griffey saved the Illini that night by breaking away from his defender, Cody Zeller, and shuffled toward the basket to give the Illini a stunning 74-72 win over Indiana, and began a total turnaround of the season that finds them now on a four game winning streak at 19-8 overall and 6-7 in the Big Ten. The Illini are in a stretch of games now that they should win, and they are making the best of the situation at hand by winning these games by a sizable margin. The latest win, a 69-41 rout at Northwestern this past Sunday evening at Evanston, avenged an earlier defeat to the Wildcats, a then resume damaging 68-54 loss back in January at the Assembly Hall. Since the Indiana win, the Illini seem to once have the confidence that they exhibited in the pre-conference part of the schedule, in which they won the Maui Invitational and also went to Gonzaga and came away with a win, a feat that very few teams can claim. Once again, it appears that the Illini are in position to return to the NCAA Tournament, barring a horrifying collapse that would mirror last season. Yes, as I have said before, this is the same group of players that Bruce Weber recruited and coached, and at times, they still look like that group that tanked down the stretch last season. The Illini have another home game that should be winnable on Thursday evening against Penn State (7:15 pm, BTN), but we all know what happens when the Nittany Lions play in Champaign. Penn State has had one of those forgettable seasons, coming into the game with the Illini at 8-17 overall and winless in the Big Ten at 0-13. But, one does not have to think back very far to realize that Penn State always seems to play Illinois tough. However, this year's Nittany Lion team is missing a key piece. Tim Frazier, who came into the season as one of the all-Big Ten preseason players of the year is out for the season with an injury. Frazier only played in four games this season, and averaged just over 16 points per game for Penn State before he was hurt. So, coach Patrick Chambers is definitely relying on guards Jermaine Marshall and D. J. Newbill to step up in Frazier's absence. Whatever the case may be, the Illini cannot let their guard down and need to take care of business at home. Who knows, we might be talking about what kind of seed the Illini will get in the NCAA Tourney, not just if they will make it this season. Speaking of remarkable turnarounds, the job that Illini women's coach Matt Bollant has done this season is short of amazing. Bollant came from Wisconsin-Green Bay, where he dominated the Horizon League. It was a foregone conclusion that Bollant would come to Illinois and reverse the losing course that former coach Jolette Law brought with her to Champaign. So far this season, the Illini are 15-9 overall and 8-4 in the Big Ten, and have surpassed their win total for last season. Illinois, winners of six out of their last eight games, had an entire week off between their last set of games, and defeated Wisconsin 60-53 on Monday night at the Assembly Hall to pull into a three-way tie for third place in the Big Ten standings. Karisma Penn, who had another solid game for the Illinois, scored 26 points and grabbed 14 rebounds to record her 12th double-double of the season. Penn has largely been the go-to person this season, but other players, such as Adrienne GodBold and Amber Moore have complemented Penn and are putting Illinois back into the NCAA Tournament picture for the first time in over a decade. The Illini have a very tough road test on Wednesday evening when they travel to Penn State to battle the Nittany Lions (6:00 pm CT, No TV). Penn State is in command of the Big Ten right now at 21-3 overall and 11-1 in conference play. Expect the rest of the country to stand up and take notice if the Illini can pull this one off. Things seem to be in a state of disarray for Tim Beckman and the Illini football team as they prepare to begin spring workouts in a couple of weeks. The coaching staff is undergoing a bit of an overhaul, as more and more of the coaches that came in with Beckman are beginning to jump ship and look elsewhere for jobs. The latest to flee is cornerbacks coach Steve Clinkscale, who apparently is headed to coach defensive backs at Cincinnati. Already gone are Chris Beatty (fired), Keith Gilmore (left for North Carolina), Luke Butkus (left for Florida International, and then the Jacksonville Jaguars a week later), and Billy Gonzales (going somewhere). Greg Colby, who both coached and played at Illinois, returns to coach the defensive line. Colby, a native of Danville, returns to his roots, and will attempt to continue what Gilmore started. Maybe the 2-10 season had a little too much to do with all of the defections, or they saw some kind of an underlying factor with Beckman that forced them to look elsewhere for job security. In any event, the coaching staff will look significantly different next season. Let's hope that it brings some wins with them, or else we might be having this conversation in a year or so with the head coaching position. Wow. Simply wow. This has only happened 3 times in the 108 year history of Fighting Illini basketball, and I am proud to say that I witnessed the last two of them, and watched the third one on television. Of course, I am talking about the Illini knocking off the #1 team in the nation. The Illini shocked the nation by defeating the Indiana Hoosiers 74-72 on Thursday night at a raucous Assembly Hall in Champaign. This has been a roller coaster season for the Illini, and beating the nation's elite team, especially Indiana, makes this even more special. Before the game, the Illini were taking themselves out of any possible NCAA tournament talk, but given the fact that now they have beaten 4 top 10 teams, I don't see any possible way that you can leave them out of that discussion at the moment. Quality wins over Butler to win the Maui Invitational, Gonzaga in Spokane, and Ohio State and Indiana at the Assembly Hall look really good on their tournament resume, but losses at home to Northwestern and Minnesota, and on the road at Purdue, are the ones that really are hurting this team right now and are the main reason that they are not considered a lock for the "Big Dance". Make no mistake about it, Indiana is a very good team, and was deserving of the top ranking in the country coming into the game. They looked every bit of it for much of the game too, taking an early lead and extending that to as much as 14 points into the second half. But, this season in college basketball has proven that you never know what is going to happen, and the Illini never gave up for a second. The seniors, namely Tyler Griffey, really stepped up down the stretch, and it was just a feel-good story all around. Griffey, who had been virtually non-existent in the past several weeks, seemingly broke out of his shooting slump by hitting a jumper, then followed that up with a three ball. Griffey finished with 14 points, but helped significantly by grabbing 8 rebounds. D. J. Richardson and Brandon Paul also contributed during the comeback, leading the Illini in scoring with 23 and 21 points, respectively. However, the final couple of plays are what people will be talking about for years to come. With the score tied at 72-72, Richardson stole the ball and was poised to go in for the game winning layup. But the Hoosiers' Victor Oladipo swatted the ball away and out of bounds with .9 seconds remaining. Out of timeouts, the Illini had to work in an inbounds play they had practiced, and Griffey broke free from Christian Watford to score the winning basket as time expired. The win improves the Illini record to 16-8 overall and 3-7 in Big Ten play, and makes the next game even more important. The Illini travel to Minnesota to battle the Golden Gophers on Sunday afternoon (5:00 pm CT, BTN), and have a chance to sustain the momentum that this big win created. As far as memorable Illini wins are concerned, this one ranks right up there with the Arizona win in Chicago back in 2005, as well as the last time the #1 team came to town, which was Wake Forest back in December of 2004. This may not have been a season saver for the Illini, but it very may well go a long way in determining their fate once the brackets are announced on Selection Sunday. The Illini women's basketball team's future is also looking up these days, as they continue to push onward toward the end of their season. Going into Thursday night's game at Michigan, Matt Bollant's squad had won their last six games away from home, bringing the true meaning of the term "road warriors" to light. However, their streak came to an end against the Wolverines, as they lost 72-69, but had a chance to tie the game at the end, but Ivory Crawford's three pointer rimmed out. Still, this season could be deemed a success for Bollant and the Illini, as they are 13-9 overall and 6-4 in the Big Ten, both marks surpassing last year's totals. The Illini also finish the regular season with 4 of the final 6 games being played at the Assembly Hall, and can make a strong case for a top 5 seed in the Big Ten tournament next month at the Sears Centre in Hoffman Estates. The Illini will welcome Minnesota on Sunday afternoon (1:00 pm CT, BTN), then take a full week off before hosting Wisconsin the following Monday evening. If you haven't been out to see a women's basketball game this season, I strongly suggest you give it a try. They are a fun team to watch! Tim Beckman landed a class of 25 players on National Letter of Intent signing day on Wednesday, and judging by the level of recruits incoming, the future could look a bit brighter. But before you accuse me of drinking from the trough that has the orange kool-aid, let me explain. The Illini won just 2 games in 2012, and the selling job that Beckman and his staff have done to bring these guys in is pretty good. Headlining the class is Aaron Bailey, a quarterback from Bolingbrook that could step in this fall and make an impact. Out of the 25, 10 are early enrollees and 5 of those came from the junior college ranks, which means that they have some experience. Other key signees in the class include Dillan Cazley from Charleston, Kendrick Foster from Peoria Richwoods, and Paul James from Miami, Florida. A complete list of the recruiting class can be accessed by going to fightingillini.com and choosing the football link at the top of the page. The Illini begin spring practice on March 5, with the annual spring game set for Friday night, April 12th at 8:00 pm. Haven't we seen this story play out before? 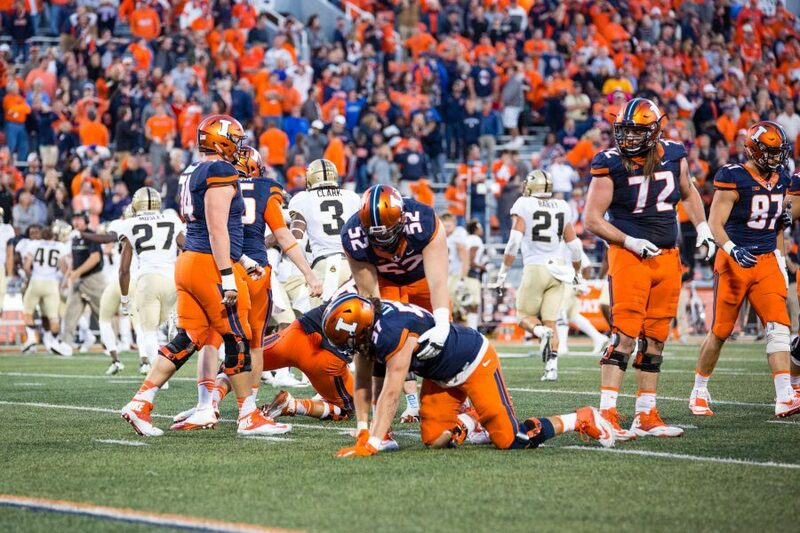 The Illini get out to a fast start to a season, to only see it crumble right before their eyes. Illini fans were glad to see Bruce Weber leave after last season, and agreed that it was time for him to move on. However, the players that he recruited to Illinois stayed behind to play for new Illini bench boss John Groce. Illini Nation was pleasantly surprised in the early part of the 2012-13 campaign, as the Illini stormed out of the gate to a 12-0 record, and put wins over top 15 opponents Butler, Gonzaga and Ohio State in their back pocket. Those teams are still among the nation's elite teams, but the Fighting Illini are nowhere to be found in the rankings, not even receiving votes at this time. Coincidence? Groce, as has been previously mentioned here, wanted to downplay the fact that his team was exhibiting a lack of confidence and was thinking about their epic collapse last season, and that the direction that they were heading was eerily too familiar with what happened a year ago. True, the schedule has been brutal, what with the Big Ten being as strong as it has been in several years. But that doesn't take into account that losing at home to Northwestern and on the road at Purdue, two games that should have pointed to wins. To be an elite team in the Big Ten, you need to hold serve on your home court and try to steal one or two on the road, both of which this year's version of the Illini have been unable to do. Granted, the last couple of games for the Illini have been tough, losing to Michigan at home and Michigan State on the road, but those were expected to be losses. Michigan has by far the best team in the conference in many years, and they are loaded at every position. Then there is Michigan State, who year in and year out, remains one of the top teams in the Big Ten, no matter how much they happen to reload. The Breslin Center in East Lansing is one of the tougher venues to play in, ans the Illini have not won up there since the 2006 season. The Illini came out looking much better than they had in previous games, scoring the first 8 points of the game to take control of the game for the entire first half, taking a 37-27 lead into the halftime locker room. Whatever adjustment Michigan State coach Tom Izzo made at the half must have worked, because the Spartans stormed out of the gate in the second half, scoring the first 14 points of the half to totally reverse the course of the game and take a lead that they would never relinquish. Once one of the best shooting teams in the nation from beyond the arc earlier in the season, the Illini have had trouble finding their range, and it has shown, especially in the win column. Senior Tyler Griffey is a distinct example of this futility, having gone from hitting long range jumpers on a regular basis to barely drawing iron on shots lately. Griffey has lost confidence enough that he is even passing on shots that normally would go in. Groce has said that the shooting woes have played a direct effect on their recent slide, noting that the team probably made more fundamental mistakes earlier in the season. However, their hot shooting masked that deficiency, and now the lack of hitting shots is beginning to take its toll. We knew this last season, but this team is soft and it really shows when going up against strong, physical teams such as Michigan State, and soon to be Indiana. The Illni , currently 15-7 overall and 2-6 in conference play, are running out of time this season, and will need a strong finish to the season to make the NCAA Tournament. Sure, they have the resume building wins to make a strong case, but bad losses (see at Purdue and home to Northwestern), have made that questionable. It now makes every win that much more important, and they can get back on the right track on Sunday when they welcome the Wisconsin Badgers to the Assembly Hall (2:30 pm CT, BTN). The Badgers thoroughly embarrassed the Illini in their first meeting of the season, beating the Illini 74-51 at the Kohl Center in Madison last month. This Wisconsin team is not the most physical that coach Bo Ryan has had in his time in Madison, but, like Izzo, he always manages to get everything out of the players that he brings in. This is a winnable game for the Illini, but then again, so was Northwestern and at Purdue. So, at this point, it remains to be seen what will play out. It all depends on which team shows up, and right now, my guess is as good as yours. I have no idea. I know I shouldn't say this, but who would have thought that the team that we would be talking about with the best chance of getting into the NCAA Tournament would be the Illini women? This statement is fact that coach Matt Bollant is doing wonders with the Illini, having now knocked off 3 top 25 teams to be in contention in the Big Ten. The Illini, now 12-8 overall and in a 5 way tie for third place in the Big Ten at 5-3, are playing some of the best basketball of all the teams in the league, and that can be attributed to the return of Adrienne GodBold, who was academically ineligible for the first semester. Karisma Penn once again is leading the team, and in their latest triumph, a 74-62 win over #24 Iowa on Thursday night at the Assembly Hall, Penn led a balanced attack for the Illini with 18 points. GodBold and Amber Moore each scored 17 points, while Ivory Crawford added 14 points. This is just the type of output that Bollant was looking for, and he was quoted this past week by saying that "I expected to get this team back to prominence in the Big Ten and visions of the NCAA Tournament, or else I never would have left Green Bay". Considering that the Illini won 11 games last season and have already eclipsed that mark this year, he is well on his way to reversing fortunes of this program. The Illini will look to continue their success on the road in the Big Ten this season, where they haven't lost, when they travel to Madison to battle Wisconsin on Sunday (2:00 pm CT, No TV). I like the direction that this program is headed. The #6 Fighting Illini wrestling team is off to a good start on the season, despite losing one of their top grapplers, B. J. Futrell to an injury. The Illini dominated Indiana by a score of 30-9 to set up a very important weekend for Coach Jim Heffernan and his squad. On Friday night, they travel to Oak Grove H.S. in Oak Grove, Ohio to battle the #5 Ohio State Buckeyes, before returning home on Sunday to battle #1 Penn State. Hopefully, with the absence of Futrell, the Illini can rely on some of the other veterans to step up and assume the leadership role that Futrell exhibited and retain their stature as one of the elite teams in the nation.